Ironically, time hasn't been kind to this game. It was one of the first indie super-hits, and one of the first retro-revival games. However, this was several years ago now, and people have realised since that retro games need some of the comforts of modern gaming to be completely enjoyable. Its two main issues I see (if you've not read the header) are occasional difficulty spikes, and story progression branches in a long, linear progression game. The former is retro "charm", the latter actually a problem of modern gaming; I understand that there was a point where I could have made the game reach a better outcome, but this is not enjoyable to have to churn through 20 hours you've already seen to reach that part, potentially miss the element that causes the story branch, not realise until 5 hours later, and realise you're wasting your life. But: what this game does have is charm in super-cute buckets. The angular Japanese translation certainly helps, as do the cute bunny creatures and the fact the main character doesn't say anything. Good thread idea Jimbob. I'll have to have a look through my games and see what was the last one I didn't beat as I've been on a bit of completion roll as of late. Damn good thread, I have real problems finishing games, so I'll be posting in here a lot. Why haven't I finished it? Well you can't really, can you. As long as there are people who want to play it in local multiplayer, or online, MK8 will carry on regardless. What I liked: Most things. The handling of the cars, the track design, what they've done to the retro courses, the gliding, the zero-gravity, the item balancing... And while I maintain that it's not the most important thing, especially not in a Mario Kart game, it is absolutely gorgeous. Especially the Rainbow Roads. Phwoar. What I didn't like: MY INTERNET NOT LETTING ME PLAY ONLINE. Or possibly Nintendo's servers? Hard to tell. Apart from that, the dodgy battle mode, the disappointing character roster, and Grumble Volcano. There was nothing they could do with that course, not yet: should have left it for a future edition. Will I finish it? Probably when the next home console Mario Kart comes out, I'll consider it "finished". I very rarely finish games, but I'm happy to say that it's increasingly because of a lack of time to spend playing them, rather than getting scunnered halfway through. Tropical Freeze and Super Mario 3D World are on the agenda, but I don't know when I'll get to them now that I've started Wind Waker HD. Nonetheless, last game I chose not to finish was Nintendo Pocket Football Club on the 3DS eShop, which, on reflection, was a bit mince. While my Activity Log says it's my second most played 3DS game, the truth is that much of that time was spent letting the game play itself. It's one of the least interactive and surprisingly humourless games I've played, and not one I'll look to revisit. 4/10. Could thread Idea, I could for quite a while. Will have a proper think there's a few like ALBW but do really want to finish that some today. Another game that fell victim to a curse that has befallen several games in the past, most notably zelda skyward sword. The curse being that another game I'm eagerly anticipating arrives before I finish it, I play that other game and lose all drive to play it. The game followed a non-traditional form of progression, where you have periods (aka months) to spend doing various things such as entering dungeons and towns, and in that time you are to find and train einherjar that you send to Valhalla before the end of each phase so they can participate in Ragnarok. Rather than having a typical plot you instead see the end of each einherjar's life before recruiting them, with bits and pieces of an overarching plot appearing little by little the closer you get to ragnarok. Battles are conducted in a semi-turn based semi-action rpg fashion. The general gist of the system being each character is assigned to one of the four face buttons, each has various moves at their disposal, and the aim is to combo the opponent as much as possible chaining attacks together. Chain enough of them together and you fill up a gauge, which allows you to use a special attack. These too can form a combo of sorts due to each hit filling the gauge. The presentation is what you'd expect from a ps1 game, using some sweet looking sprites for the characters and pre rendered backgrounds for the levels. The music is classic Sakuraba, boasting strong compositions that make the absolute most of the instrumentation available at that time, the battle themes are classic jrpg and both catchy and addictive to listen to. Its been some time since I played this so my opinions have been somewhat diluted, but overall I think it's a classic jrpg and can see why its liked. Going in to it I thought I'd be somewhat worse off for having played the sequel and prequel Silmeria, but as it turns out I'm actually better off playing 2 first as there were some plot twists that come out of left field for those unfamiliar with certain characters and their true natures. All up I'd give it 7.5 out of 10. Its aged a bit and I'll admit I'm a little shallow so that does actually affect my overall view of the game, but despite the aging its a swell game whose only main fault is a somewhat weaker story due to the structure of the game. I was quite disappointed by this even though the same fun game play elements are there & I like what they done with the story to bring in all the other villains etc, it was just too familiar to AC (which I had played quite recently on wii U at the time) map wise & the small area that was added may as well have not been there at all. It also had the most pointless Online MP attached to it. In total agreement. The limitations of the whole thing just drag it down so badly. As soon as I need the space on my SD card, it's gone. But... is it right to review a game you haven't seen the end of? Worked out for Last Story in the press though didn't it? For me the last game I didn't finish was A Link between Worlds. Don't get me wrong, its a good game, about halfway through It just petered out. The game felt like the most point to point Zelda I have played going from dungeon to dungeon without much happening in-between, I get that its a 2-D Zelda but i'd say that the Oracles games have still pulled an immersive world off best. Minish Cap also had more about it, the puzzle pieces you aquire tied exploration to interacting with townspeople in the game and I just feel like this is something that is missing in Link between Worlds. The whole painting mechanic just seemed a bit uninspired and displaced from the rest of the world If they had pushed it into being more than just a puzzle solver, maybe a whole painted town or painting themed dungeon? Then I could appreciate it. The rent an item never really clicked with me, item upgrades definitely didn't, that upgraded flame rod was ridiculous. I doubt I will finish this game which is a real shame, It is a beautiful game and certainly one of the better 3ds titles but it all just feels a little hollow. I can't really think of anything specific myself. I put a few games down (mostly JRPGs) but I generally end up returning to them at some point. A few I've got on a pretty long hold at the moment include Bravely Default (finding/beating the dragons for a sidequest stopped me playing it on the train), Persona 4 (nasty boss beat me up too many times), Final Fantasy X (I really wanted Lulu's ultimate weapon but dodging 200 lightning bolts in a row is real tough, plus dark Valefor kicked my arse) and Kingdom Hearts (seriously, why do I have to go back and basically grind each location...). Dark Souls probably also counts here, it keeps getting pushed down the list because I know it'll be hard to get back into. If I may ask andy what was the boss in persona 4 that beat you too many times? Yep, great idea for a thread. 1. The camera is too slow. You can instantly switch it through 180 degrees but it never seems to be quite in the right place when you're fighting multiple enemies even when you move it manually. 2. Whilst the Netherworld is very pretty and the battles interesting, i don't like being pulled out of it to go to the 'real' world of Doolin. I know its story progression but i don't want to be there. 3. The cut scenes are plentiful and irritating. I can only describe them as individual comic book 'panels' but there's several of these panels to each scene. Couple that with the fact you have to press a button to advance each one and most panels start off blurry and come into focus. I hate this effect sooo much! 4. The mini map. The frickin' mini map!! It constantly changes direction. Not like as in....say Baldur's Gate: Dark Alliance where it orients itself to the direction you're facing. No...that would be too easy. Instead it appears to randomly switch about...so sometimes your character will be looking into the screen (so your map should have you look north) ....nope... i'll glance at the screen and sometimes the map will have the character pointing south. Its so confusing. I frequently end up going back in the direction i've just come from after a fight, unless i recognise a landmark. Its a shame, as i feel its packed with potential....i just haven't got the inclination to unleash it. I've had feelings like that with DSII at times as I'm having big breaks between each play session but surprisingly its not been that bad especially if you go back to older areas to get a feel for it again or plonk a summon sign down for some jolly co-operation. Right had a look at games in my collection as I just trade in some like Yoshi New Island which I never finished and over 21 years of gaming going to be loads I've not finished, also only going to review games that have had a decent play time. The Legend of Zelda: A Link Between Worlds 3DS: I've got to Lorule, I would like to finish this but it seems to be go to shopkeeper rent all items go to dungeon to dungeon. With nothing really in between but might be me growing up with 3D Zelda's not 2D's. Going to give this 7.5/10. Contrast PS4/PSN: Got quite far on it in till I got to some elevators and not gone back since which was when the PS4 launched, really liked the style of this and the story of it but didn't play that great. So it's going to a get a 6/10. Tearaway VITA: Ohh what a game can't give it enough praise, if Nintendo made a game on a VITA it would be this it's that good. I know this is a short game, so can't have much left to do on it but still not got around to it but will. Going this a 9/10 yes it's that could worth playing if you have a VITA or get your hands on one. It was the foetus/pixelman boss. I couldn't stop it rebuilding its pixels and it was packing far too much of a punch. Shame because I was really enjoying the game. It probably doesn't help that I'm very reluctant to summon anyone. Don't want to end up with someone who basically does all the work for me and I don't have much worth doing. Why haven't I finished it? Quite simply, other games came along. Other games I reckoned that I'd enjoy more. What I liked: The quirkiness of it all. The story and the characters are wonderfully demented. I got up to the Happy-Happyist cult, with their "blue... blue..." chanting, and that was my favourite bit so far. What I didn't like: It just feels a bit old, is all. Unsurprising, perhaps, but it's competing against eShop and Wii U retail games for my time. Plus, while the towns were entertaining enough, the paths and dungeons outside them weren't terribly well designed. Will I finish it? Probably not. I currently have at least five games on my Wii U I want to finish, including two I haven't started, and Earthbound just doesn't have as much appeal as them. Score? No. EB is a game whose best bits come at the end, as things get more and more messed up. I don't think I can score the game based on what I've done. I meant for you to be summoned and help others so you'd be the one potentially wrecking a boss. Ah, I've not thought of that. Might just pick it up again soon. fusing a black frost. It's a bit of a powerhouse at that point in the game and it learns agidyne along with fire amp which really helps lay the smackdown on the boss to reduce the amount of times he remakes his avatar. You'll need to level it up a bit for those two skills, but I found it really helped. Also if you aren't doing already try abusing buffs and debuffs, some games they don't really make a difference but using them both to raise your stats and lower the foes can help boost your survivability. Teddie's a good character for buffs, I can't remember if he starts learning the party affecting buffs when you get him or in a dungeon or so's time but he's a good buffer as he learns all three so keep an eye on him. It may seem like a bit of a grind for all of that, but it's worth it as the stuff you grind up if you grind that stuff will do you good for a while. The thread title has already got me grinning. For me it would be Atelier: Escha & Logy. Not that it's bad in any way, it's just that Gust have streamlined the time management mechanics into distinct, four-month chunks. So you'll complete your given task pretty quickly, leaving a good 90 or so days to do the rest of your tasks (in this RPG you're given a cool bingo card of 16 tasks, where you get better rewards the more lines you complete from the set). And there lies the problem: in the six tasks I have already completed (out of around 9 or 10 across the game), I've always finished with far too much time, and filling that time is tedious, I'm either grinding in preparation for what I've heard is a difficulty spike at the end of the game, or I'm synthesising goodies. It's just not particularly interesting to do any of this, though, since you're never really making any extra progress. So I've kept the game on hold for now, though I'm sure I'll probably return to it every now and then to do another task until I've finished it. Thanks for the heads-up on Nintendo Pocket Football Club, folks. I held off on buying it at the time, but was very tempted after it went all over social media and The Twitter (I have a feeling the same would have happened with Tomodachi Life, but Mario Kart 8 and E3 seem to have sadly overshadowed it compared with Animal Crossing's invasion last year), but I'm somewhat glad I did after reading your assessment. I guess it's another case of addictive qualities within videogames not equalling good. Did try the Japanese demo for it (the game is a good 5x more expensive on the Japanese eShop since it was a retail game there!) just to check out the gorgeously rendered matches though. Why haven't I finished it? Mostly because my first 3DS got stolen, with my 35h playthrough in the SD card. I've tried replaying, but have been unable to enjoy it. What I liked: It feels like a proper "open-world" RPG for the first time since the series began. A proper town! With fetch quests! And the battle system is solid as ever. It also contains a gratifying amount of fan-service, including the ever-adorable Yoshis, a return for a favourite M&L character (not Fawful), and several humorous Luigi moments, as is traditional for the series. 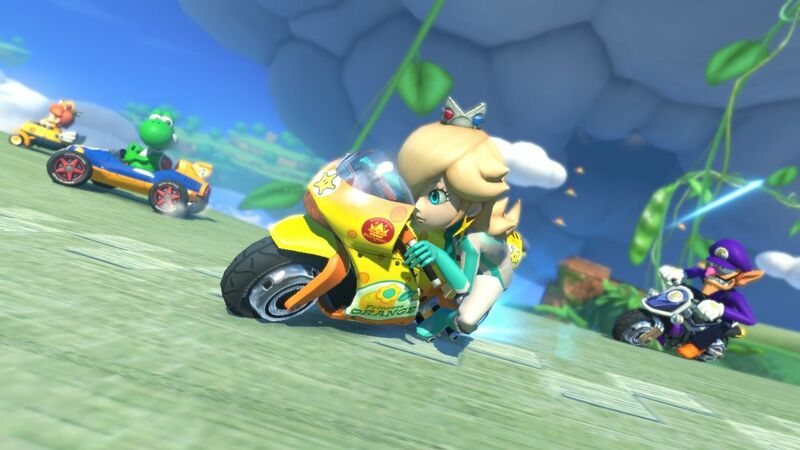 No wonder he snapped in MK8. What I didn't like: Soooooo slooooooow. This is primarily a problem with the Dream World (although some set-pieces made me groan - looking at you, drill-machine thing) - I didn't like the franchise's planar sections in BIS, let alone with incredibly easy puzzles and lengthy unskippable tutorials thrown into the mix. I preferred bros. battling to Dream World battling too. And don't get me started on the giant battles. Oh, and the special moves need to be freshened up for the series' next entry. If I have to send Mario underground to go under a wall one more time, or spin jump across one more gap, I'll not be amused. Will I finish it? Very unlikely. I've tried to restart it, but the slow pace of the Dream World makes me dread firing it up. I've played every other game in the series at least three times, but I've yet to reach the sandy area a second time. Other games I haven't finished (and probably won't) in recent times: Game & Wario, Fire Emblem Awakening, Animal Crossing New Leaf. I also recently traded in Assassin's Creed III, still in its original cellophane. "Last Game You Didn't Start and Your Thoughts", anybody? I can appreciate your woes, Balladeer. Even looking back on it, despite it being an entertaining RPG, each chunk of game world dragged on for far, far too long, with too much unnecessary padding and too many rooms or locations within the dream world feeling uninspired. 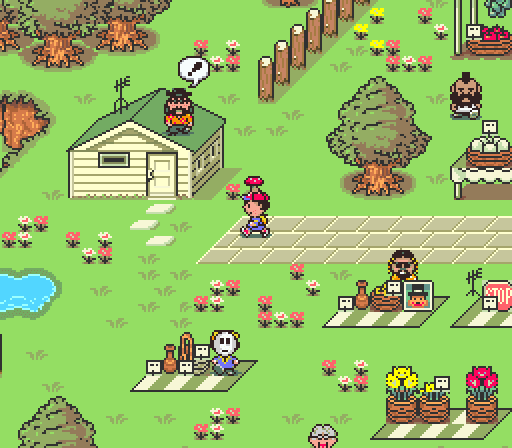 And the overworld itself never really felt interconnected like Superstar Saga's world, adding to the fatigue: each new location you'd visit would be an eight or so hour visit. I actually ended up selling my copy because I'd rather have 15 odd quid, and unlike its predecessors I don't think I'll ever play through it again. Though I would boot it up now and again to adore the terrific hand-drawn sprites and fantastic soundtrack. Though I must add unless your score's exactly reflecting your enjoyment with the game, it's otherwise too harsh: Dream Team Bros. (hereon abbreviated to DTB) is still a solid RPG, lovingly and inoffensively made, just isn't as good as a coherent whole as what came before it. I don't know what else a score is supposed to reflect! I enjoyed less than half the game, so I'm giving it less than half the marks. I didn't even think that the soundtrack or graphics were particularly great - average, I'd say. It had other factors that were above average and yet others below, and so I put them all into the Balladeer's Score-omatron, and it came out with a score slightly below average. 4/10 is not a disastrous score. It's just below average. A "severe flaws but if you enjoy the genre you'll get something out of it" score. And I'm aware that many publications don't use it like that, but, well, they're using it wrong.